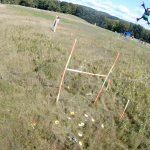 Racing a quadcopter is amazingly complex and nuanced. It’s hard enough getting started learning to fly, and if you’re flying in stability mode then switching to acro/rate mode feels like starting over. 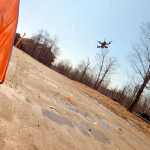 Getting the quad to do exactly what you want takes hundreds of flight hours, and you can finally improve from intermediate to advanced flight after an endless number of flights. To win races, though, you need more than comfort behind the controls. You also need an understanding of how to find the fastest possible route, and it isn’t always about raw speed. For the next two months, we will be posting a series of articles each Wednesday. This series covers advanced techniques and theory for circuit racing. In this introduction, we’ll be covering some general concepts that apply everywhere. While this article isn’t especially advanced, it lays the groundwork for specific in-depth topics we will dive into as the series continues. This series will not cover drag racing, where reaction time and the performance of the parts you’re using play a much greater role. Let’s get one thing out of the way up front: improving your skill has more to do with flight hours than anything else. The single best thing you can do is practice. If you want to be the best you can, you need to practice continuously until flying is effortless. Set yourself a practice regimen and stick to it. Simulators are not as good as real-world flight hours, but can still be helpful if actual flying isn’t an option and might be the right place to practice difficult maneuvers instead of causing yourself to have an expensive crash. There’s a lot you can do to train yourself to find the fastest, cleanest race line. This series will help teach the theory, but you’ll have to combine knowledge of what makes for a low lap time with maneuvering skill and control. Only practice will give you that control. During this series, we’ll suggest exercises that can help you instinctively apply race theory when you fly. If you are serious about improving your racing skill, get out there and practice. Racing is not about speed. It’s about managing momentum. As you build speed, drag increases. 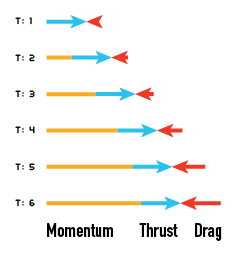 Top speed is reached when thrust = drag. A quad builds momentum quickly as it heads in a given direction, and that momentum follows the direction of travel. To navigate around a corner, a change in direction is needed. The existing momentum is opposed to change; it continues to act in the same direction it was built. When the quad turns, that built momentum is felt as drift—the tendency of the quad to continue moving in the direction it was moving before. Unless you want to keep moving in that direction, you have to negate that momentum and stop the drift. Drift isn’t always unwanted, but it must be controlled. One factor working against momentum is drag. A quad encounters drag when it is moving at a different velocity than the air around it. Drag can have complex effects, but for the purpose of this series there are only a few simple points to remember: the air will always work to slow you down, wind will influence how you take your turns, and as speed increases, the effect of drag increases more. We’ll discuss the theory involved, but there’s no substitute for real-world experience here. Understanding how wind affects your flights is extremely difficult to get a feel for with a simulator. Circuit racing is often not about raw speed, but the preservation of as much momentum as possible. You need to maximize how you use the energy you put into the quad. Gains you make by having a more powerful quad often pale in comparison to losses from working against momentum you have built. If you get nothing else from this series, remember this: Races are won and lost in the corners. Corners are where you manage the transition from momentum in one direction to another. Finding a better line beats hitting the accelerator hard and overshooting, every time. Once you understand where the ideal racing line is, it’s your job to stay on it. If you have to choose between carrying more speed and staying on the line, stay on the line every time. This is going to feel slower. In a way, it is slower—you won’t hit the same top speeds when you race this way. The benefit is in not having to fight that extra momentum around every corner. Bleeding off extra momentum actively takes away from your ability to go in the direction you want. Not going in the direction you want means wasting time correcting your quad. Prioritizing the race line over raw speed gives you a greater ability to stay focused and not make snap corrections: slow is smooth. Staying on the race line means all of your momentum is being used in the direction you want, and you’re not wasting time and energy fixing overreach: smooth is fast. It takes getting used to, but I promise your lap times will show the difference. When you are able to hit the line consistently, you can add a bit more speed in search of the limit. This old adage is especially true in quad racing, where small mistakes often result in a DNF. Rally drivers often speak of how close they are to being “on the limit”. The limit is the maximum possible speed before the grip gives out and the car can’t stay on the road. It’s highly variable and constantly changing with road, weather, and tire conditions, so drivers must be extremely skilled in order to stay “on the limit”—at the maximum speed the road will allow. Staying under the limit is safe but slow, while going beyond the limit nearly always means crashing out. As quad racers, we experience the limit slightly differently but the concept is the same. We want to approach, but never exceed, the limits of our piloting skill. It’s always better to work your way up to the limit rather than go beyond it. Stay below and find it by working up slowly. You’ll spend a lot less money and finish a lot more races. Even if you don’t win, you’ll get more points than everyone who never finished. 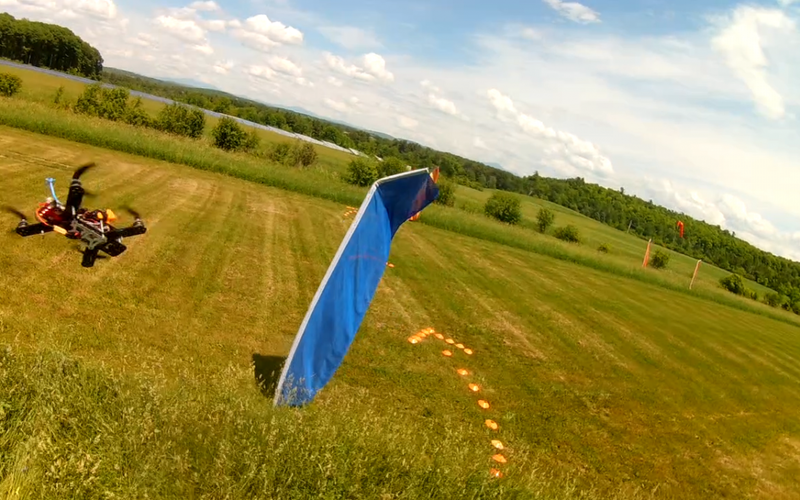 Smooth, controlled flight is your friend. In addition to the benefits of better lap times, this also does a better job keeping you in the air. The limits are further away when you’re cruising on the line instead of barreling wildly through the turns. Practice good lines before practicing speed. Whenever you practice a defined course, set up a lap timer. 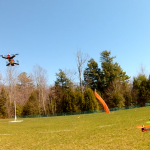 There are many ways to do this, (see our lap timing guide for drone racing,) so find one that works for you. The purpose of timing your laps is to be able to try out different tactics and see right away whether they made a positive difference. It’s not always obvious by how something feels, so it’s good to get real data as you go. If you can fly the same course across many days or months, it can help you see your long-term progress as well. A cheap Wizard X220 ARF can easily compete and win against purebred race machines: I frequently finished in the top three with mine. 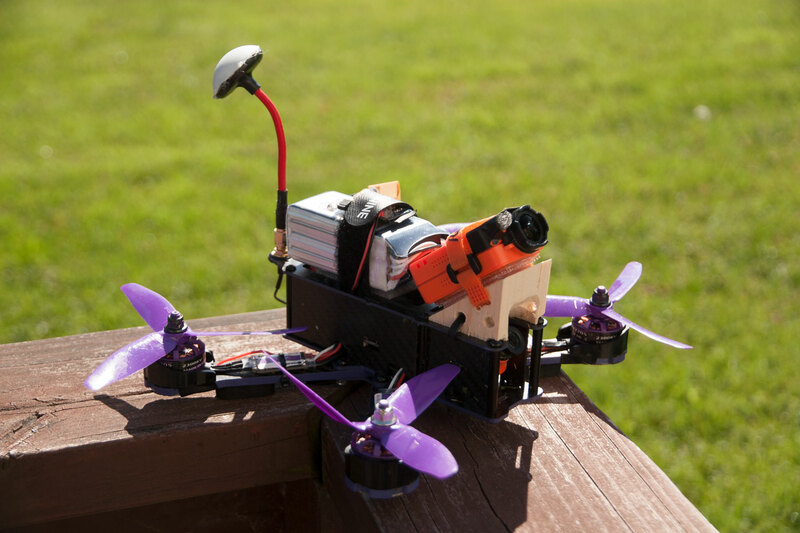 As a racer, you probably spend a lot of time thinking about every possible advantage: can I buy faster motors? which props should I use? where can I save weight? what about aerodynamics? There are definitely equipment choices that make a huge difference: a 3S on 5030 props will have a hard time against a 4S on 5051. Some equipment does offer a significant advantage. The reality, though, is that most parts are fairly similar and some offer very little performance gains over cheaper alternatives. The pilot’s skill makes a much larger difference. Only top-tier pilots will see a significant difference with expensive “race spec” equipment—and even there, I would argue pilot skill is still the deciding factor. To win races, focus on improving your skill over improving your quad. Our introductory practice exercise might seem a little counter-intuitive for a series on racing, but it will serve you well in the long run. While you are practicing laps, make your turns as smooth as possible. To do this at first, you’ll have to slow down! Concentrate on smoothly entering a turn without jerking the sticks, and then easing back out of the turn onto the next straight. You should be avoiding mid-turn course corrections. These quick micro-adjustments are a sure sign of being on an inefficient race line, and you should be working to eliminate them. It’s easier to develop in this area when you’re not trying to push the throttle as hard as possible. Practice “slow is smooth” and take your turns with care. Eventually this will become natural—but for most pilots, it’s a skill that has to be learned. Next up: trim the excess by learning to tighten your corners.